Happy November guys! I can't believe we can now say that Christmas is NEXT MONTH! EE, can you believe it? This year has just completely flown by. I do love this time of the year and all the excitement surrounding it though so I can't say I'm complaining! As you know, the start of a new month means looking back at my favourite products / things from the month before. I always love doing this but when it comes to beauty products, I don't always have a new group of favourites every single month as I often stick to using the same items of a daily basis. With this being said, I thought I'd share my Non-beauty favourites instead - all of those things I've been loving that don't fall under the beauty category!! Fresh flowers; I can't even begin to tell you how much I'm loving fresh flowers at the moment. I've had them on the dining table in my flat for months now and buy them on a weekly basis. There's just something about them for me that makes me feel good and makes my flat feel so much more homely. Not to mention they look super pretty and brighten up the room. The ones photographed here are some of the most beautiful I've had so far - they're a mixture of a bouquet I bought from Tesco and some I had delivered from Bloom and Wild who I highly recommend you check out. They're a flower subscription service and deliver beautiful fresh flowers straight to your door. Perfect! Topshop pumps; I've always been a heels girl and you won't often find me wearing flats. My go-to shoes for day to day wear are my trust ankle boots with a chunky heels but I recently got really sore feet after walking on them all day and decided I needed a pair of flats in my life for those days I'm going to be walking for long periods of time. Luckily, I came across these cute Topshop pumps on a spontaneous shopping trip recently and I fell in love with them. I love the black and white contract, they look great with a pair of jeans and more importantly, they're SO comfortable! Starbucks Pumpkin Spice Lattes & Bio Sculpted Nails; So this photo serves as a double favourite as I've been obsessed with ordering the Starbucks Pumpkin Spice Latte's recently (perfect Autumnal drink) and I've also been loving getting my nails done. I've been getting them done every month since May now and I can't imagine not having them anymore. I've never been able to grow my natural nails so these are the perfect solution for me. I go to a salon called Bella Spa in Manchester and they're brilliant - they do 'bio sculpting acrylic' which is were the acrylic is built up on the nail to the desired shape and length so there's no damaging glue used to stick on the tips. I recently got them 'coffin' shaped as you can see in the above photo and it's my favourite shape yet - I'm also loving this mauve nail colour. It was a gel the salon had so I'm not sure on the exact colour unfortunately!! HA Designs Personalised Clutch Bag; I love anything personalised so when this clutch bag from HA Designs landed on my doorstep, it was love at first sight. I use clutch bags every time I go on a night out and this plain black leather one is just perfect as it will go with everything. I love the shape and size and the leather is so so so soft - it feels of a really high quality. Not to mention the little 'KJ' gold initials in the bottom right hand corner. A bag with my initials on it is just so much more special than any of my other bags so I know this is the one I'll be reaching for from now on! Make sure you check out the HA Designs website as they have SO many cool personalised products from makeup bags to candles. I'm already thinking about who I can buy gifts for from their site. Jo Malone Pomegranate Noir Candle; I love burning candles in my flat all year round but when the weather gets colder and the nights get darker, they're a complete must have for me. Recently I've been burning this beautiful Jo Malone 'Pomegranate Noir' candle that was very kindly gifted to me. I must admit I have burnt this way too fast and probably should have saved it a bit more due to it's high price tag but it made me room smell so good that I just can't resist burning it every day. If you want to treat yourself to a luxurious candle this A/W, go have a sniff of this one as I'm sure you'll love it too!! LVNDR Jewellery; If you've followed my blog for a while or if you follow me over on Instagram (@kayleighjcouture), I'm sure you've seen my mention LVNDR a few times! That's because I jut LOVE their stuff - they have the cutest jewellery and recently started stocking clothing too which is also amazing! 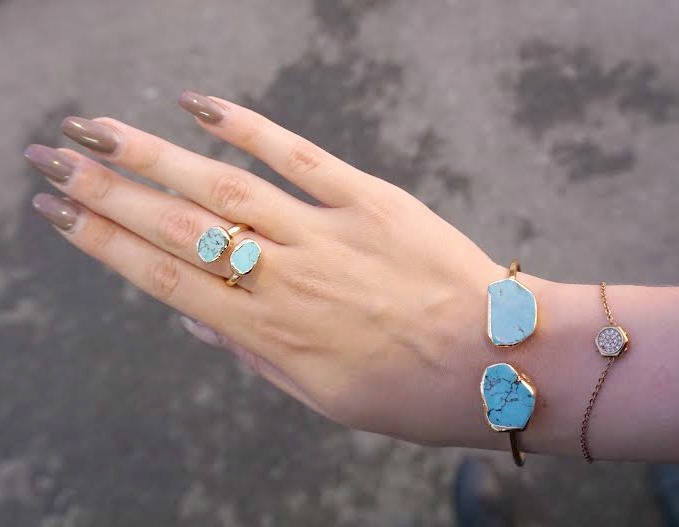 I've been wearing this turquoise marbled bracelet and ring set none stop recently and have had so many compliements on them - they're just so different to anything else I own. They've recently launched a whole range of marble jewellery and I need to get my hands on it all so definitely go and check it out here and if you fancy treating yourself, you can get 10% off your order with my code KJC10 too!! Autumn Leaves; I just love love love it when it gets to this time of year and the leaves turn all kind of beautiful autumnal colours and fall the ground. I took the above photo whilst I was on my way to the post office the other day and just look how beautiful those leaves are? 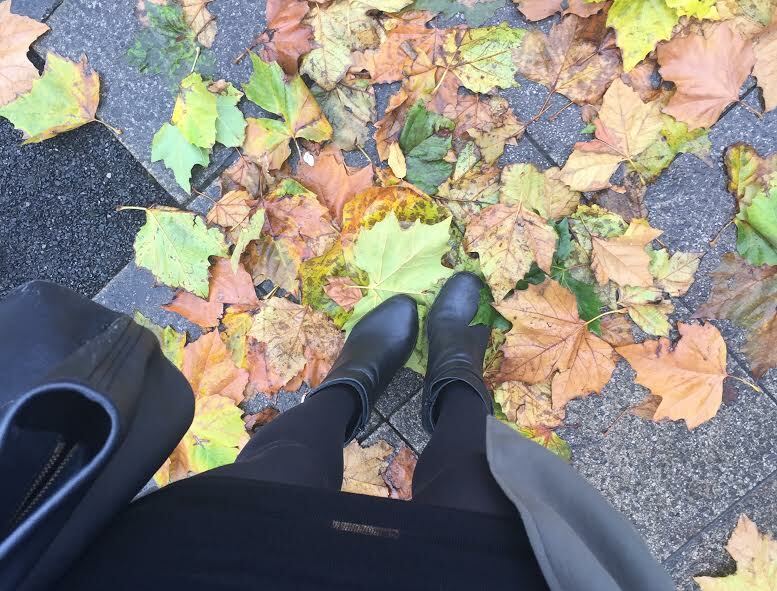 Nothing beats a beautiful autumnal walk with a hot drink in hand and surrounded by the prettiest leaves!! So there's my current non-beauty favourites! I hope you enjoyed this post and do let me know if you'd like to see more of these. I'd also love to know what you've been loving lately so let me know in the comments below!! How cosy is your apartment?! I've heard of bloom and wild must Check them out the flowers are beautiful, eep I'm so excited for Christmas! I just picked up the JM Pomegranate Noir cologne for winter and it is SO lovely, I can only imagine how nice the candle version is! Those flowers are so pretty! Fresh flowers are always the highlight of my week. These flowers are so pretty! I love the turquoise marbled bracelet too, its gorgeous! 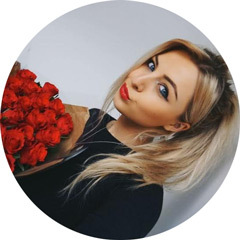 I absolutely love this post Kayleigh :) It's such a good way of having a peak into your month and I always love being nosey at what people have been loving! Those flats from Topshop are so beautiful and definitely the sort of thing I need in my wardrobe; I've been living in a pair of basic black pumps but they're starting to look like they've seen better days. Those flowers look gorgeous, I can see why they're in your favourites! Here the leaves are already starting to make way for snow. It's amazing how much fresh flowers can brighten up a space - I really should get them more frequently. And love the LVNDR jewelry! with you on autumn leaves! Feels like reading through a list of my own current faves haha! That bracelet is so gorgeous!! Bloom and Wild is such a lovely idea, those flowers are gorgeous! Absolutely love Justin Bieber's new song as well it's so good! That is one of the most beautiful bouquets I've ever seen! The colours are stunning. That clutch is gorge too. I really love Jo Malone candles too, wish I could smell through my screen haha! Lovely post and lovely blog sweetie.